Major Martin Everett TD has been awarded an MBE in New Years’ Honours 2011 for services to The Royal Welsh Regimental Museum (Brecon) The Museum was known as The South Wales Borderers Museum – the regiment’s involvement in the Zulu war of 1879 is legendary – the modern regiment is ‘The Royal Welsh’. Martin Everett was born in Woking, Surrey when his mother was evacuated to escape the London bombing. 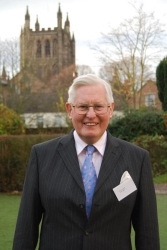 His parents moved to Hereford and he attended Hereford Cathedral School between 1956-1959. Being a keen mathematician he decided to train as an Actuary by joining the Phoenix Assurance Company in the City of London. But he was soon diverted into the world of Computing. His company had then bought one of the early commercial machines – a LEO – that was a direct successor to the machine developed Manchester University from the mechanical & electronic code-breaking work done at Bletchley Park. After a life-time developing major computer systems, on retirement Martin joined the Regimental Museum in Brecon in 1992 as a part-time archivist. In the meantime he had also served over 36 years as a part-time Territorial Army soldier; starting with the Honourable Artillery Company in the City and then for the last 20 years with The Royal Regiment of Wales, reaching the rank of Major and discarding his uniform in 1996. In April 1998, he was appointed Curator of the Museum. Always keen military historian, Martin has travelled widely to the many battle sites in North America, Gallipoli, The Western Front, The Crimea, India and more particularly South Africa. More recently, he collaborated with South African historian, David Rattray, on a book ‘A Soldier-Artist in Zululand’ which brought to light some 120 watercolour sketches from the 1879 Anglo-Zulu campaign. Until he retired he was a Committee Member of the Federation of Museums and Art Galleries of Wales, and is a member of the Society of Archivists and a Fellow of the Royal Geographical Society. In June 2006 he was one of the initial recipients of HE Prince Mangosuthu Buthelezi award for Service to the Zulu People. Martin was able to welcome Prince Buthelezi, former South African Minister of Home Affairs, to Brecon in February 2008. Martin, now aged 71, retired from museum in March 2011 and lives in Tintern in the Wye Valley. The award shows that retirement ‘hobby’ can bring significant and unexpected rewards. He continues to undertake research to enhance the regimental archives.